Epson's TM-U220: TM-U220A, TM-U220B, TM-U220D printers are the enhanced, more powerful successors to Epson's best-selling TM-U200 family. 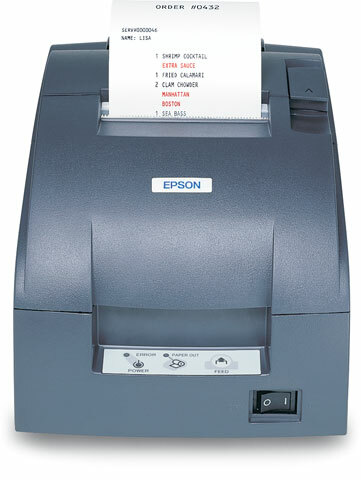 All three printer models in the Epson TM-U220: TM-U220A, TM-U220B, TM-U220D series are optimized for high-speed throughput so customer receipts and kitchen orders print faster than ever. For maximum efficiency, the TM-U220 A (with journal take-up and auto-cutter), TM-U220 B (with auto-cutter only) and TM-U220 D (no options) all offer drop-in paper loading and two-color, black and red printing to highlight special offers and print more visible logos, and an adjustable paper width feature that allows you to use 58, 70 or 76 mm paper rolls for more flexibility and greater cost savings. USB2 Connect-IT card no DM port or hub. Black Ribbon for TM-U200, TM-U300, and TM-U375, Single Ribbon. The Epson C31C514664 is also known as Epson POS Products	EPS-C31C514664	.